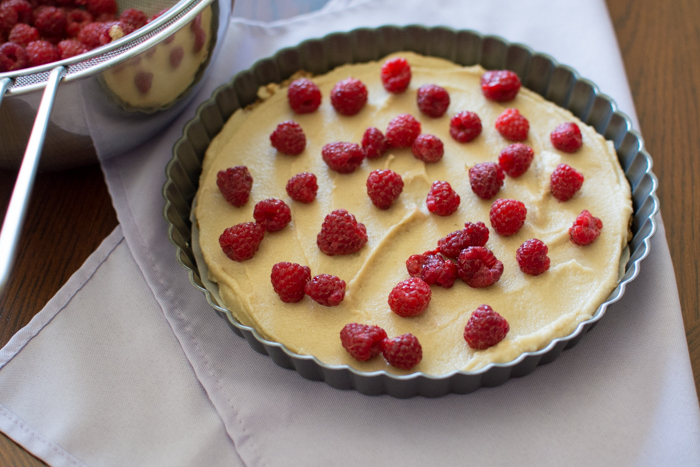 Want to make a vegan raspberry cheesecake that has a creamy tart filling dotted with fresh raspberries? Truthfully this recipe comes together pretty quickly outside of the waiting time. 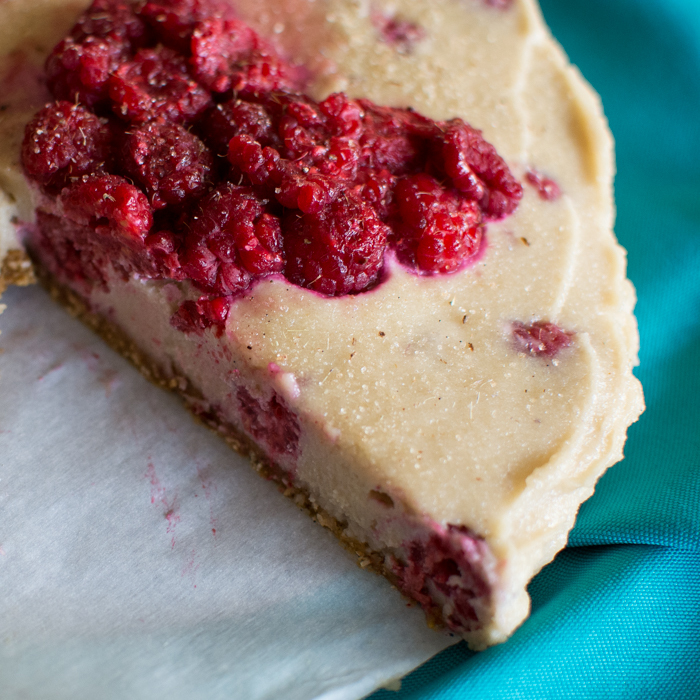 There’s waiting time while the cashews soak and there’s waiting time while the cheesecake sets in the freezer. The crust is chewy and a little gooey thanks to medjool dates. I kept nuts out of the crust, because there’s plenty in the cheesecake portion. That’s where old-fashioned oats come in. They take the place of nuts in this crust and provide a great texture and lower fat content while boosting fiber and even protein. I had the kind of raspberries that were falling apart they were so juicy and ripe. 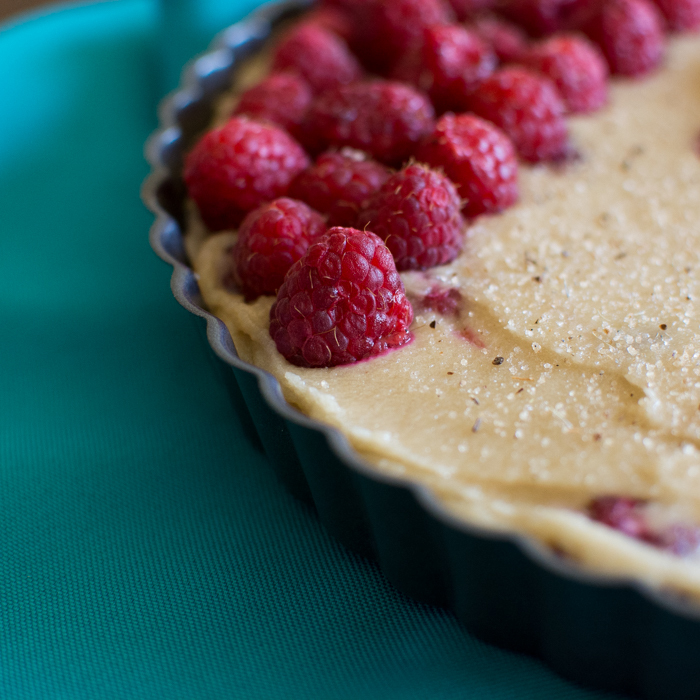 Leaving a layer of raspberries inside is like hiding fresh fruit treasures. Tart little flavor explosions. Now for the remainder of the batter. 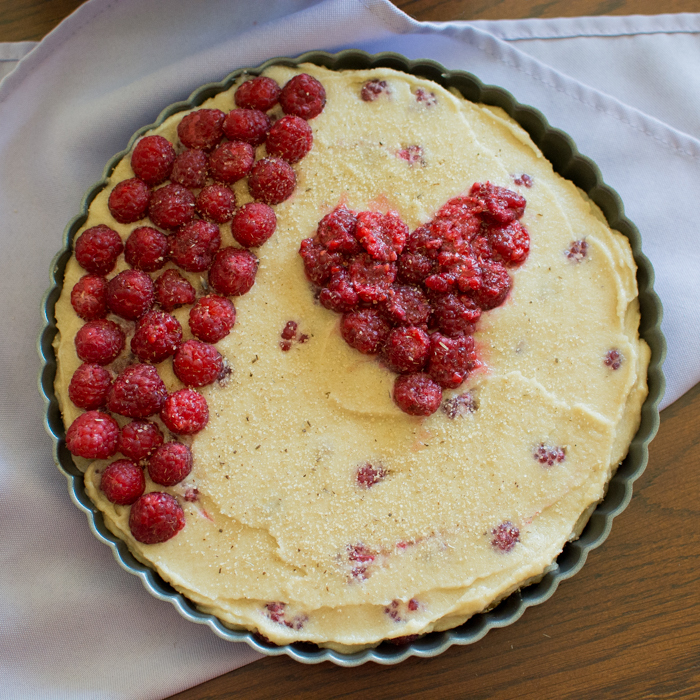 I love how the center raspberries poke out just a little bit. Sprinkled on top is a light dusting of Lavender Vanilla Sugar. I bought this when I was back in Illinois. Truth be told I don’t use it that often, but I did like it on this cake. The lavender added a nice light touch of color and flavor. Feel free to skip it though. 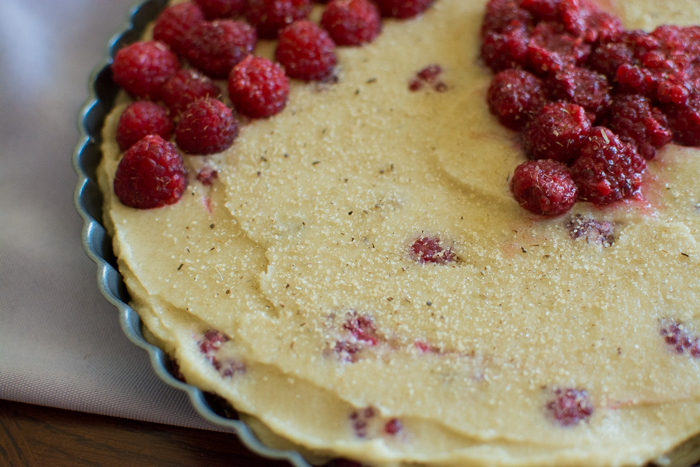 Cut a piece of wax paper or parchment paper about the size of the bottom of your tart pan. Place it in the pan and set aside. I used a 9 inch x 1.125 inch round tart pan. Cut 2 at least 12x12 sheets of wax paper. Add the crust ingredients to a food processor fitted with an s-blade and process until a ball forms. It will be noisy, but delicious. The crust is easier to work with if your hands are slightly damp. Go do that. Lay down one of your square sheets of wax paper on the counter. Place the crust dough in the center and place your second piece of wax paper on top. 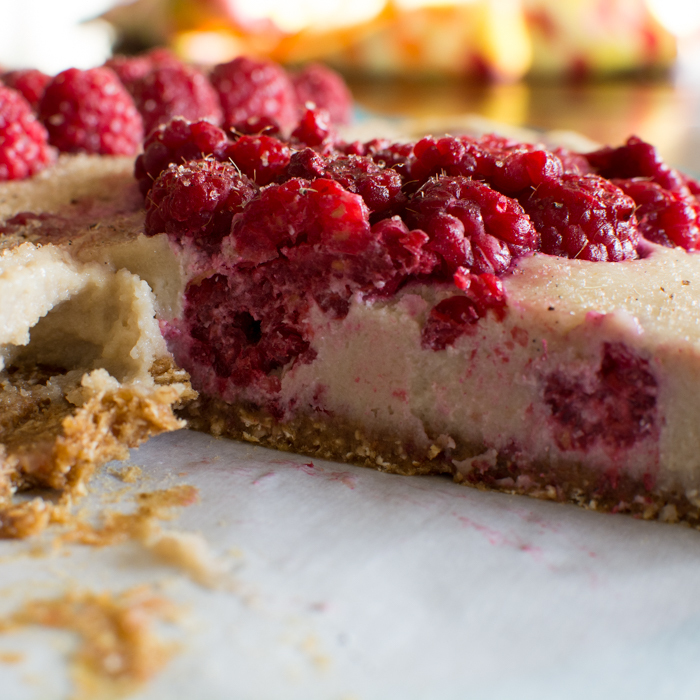 Using a rolling pin, roll out the crust to as close of a shape as the bottom of your tart pan. Peel the wax paper off and lay the crust into the lined tart pan. Press into the pan to further shape if needed. Rinse out the processor or wipe out any larger chunks leftover from the crust. No need to wash completely. Get it set up with the s-blade attachment one more time. Strain the cashews and add them plus coconut oil, lemon juice, sugar, agave, salt, vanilla, and water to the food processor. Process until ingredients are smooth and combined. It should resemble a thick cake batter. Add additional water if needed, a tablespoon at a time. 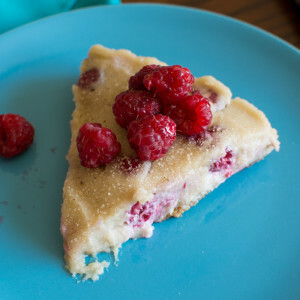 Using an offset spatula—spread half of the batter over the crust. Next arrange half of the raspberries, crumbling or smooshing if you want. 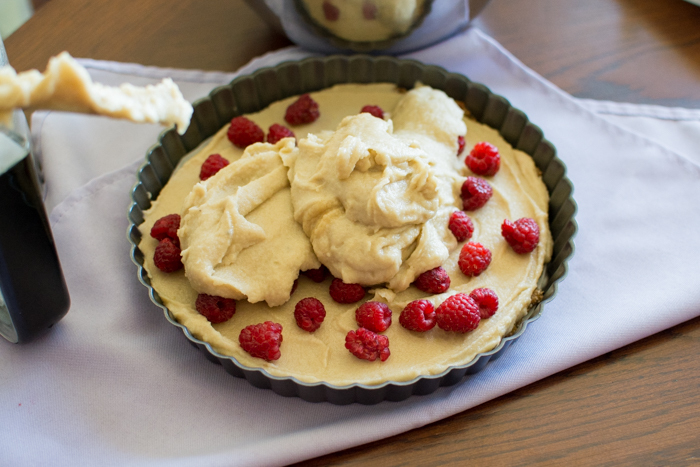 Spread the remaining batter over the raspberries and create as smooth a surface as possible. Place in the freezer for 4-5 hours to set. To serve, pop out the bottom of the tart pan and cut into 8-10 slices. Keep leftover slices in the freezer ready to go. 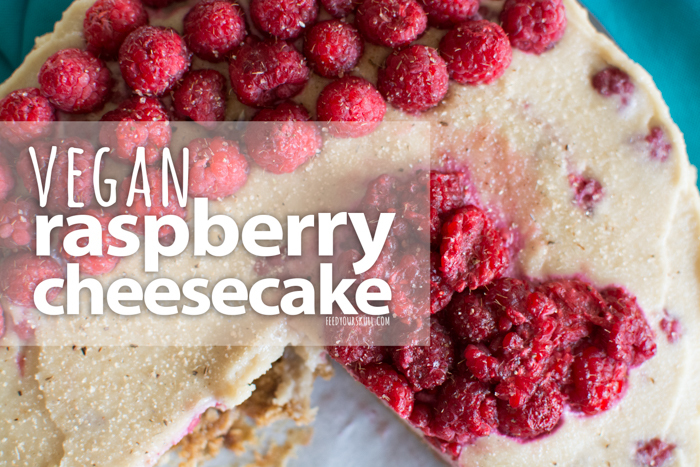 If you let the cake rest 5-10 minutes after pulling it out of the freezer and before eating it softens just right.